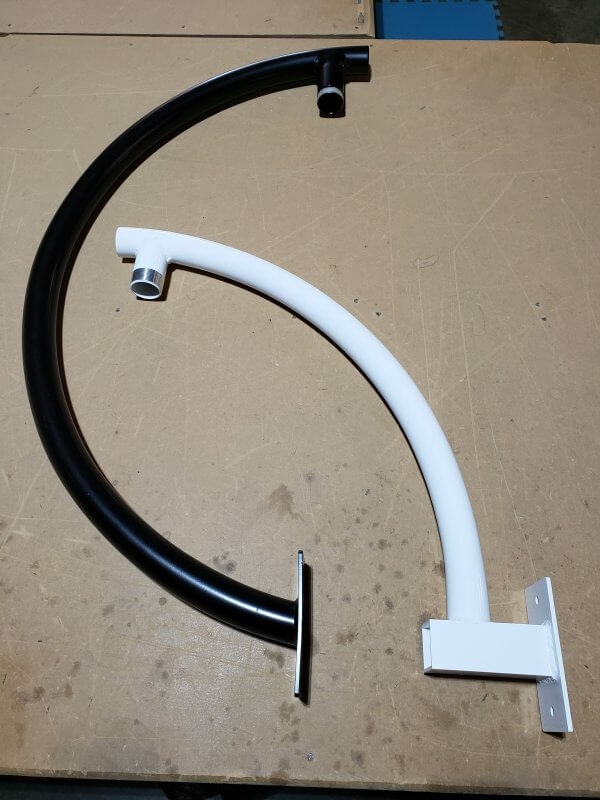 Our camera pole accessories bring a new stylish way of mounting your PTZ, Dome, and Panoramic cameras. Like the Fly-Out PTZ Camera mount and the Fly-Over Mount that is designed to get the structure as far from the camera as possible so that it blocks the least amount of camera view, while still being attractive and functional. We provide a 1-1/2” NPT threaded pendant mount that will fit many common PTZ Cameras, Dome cameras, or the Panoramic Cameras, but a reducer can be used to fit other sizes, as well as a female coupler. We also have the optional panoramic mount and dome mount that can be used with either arm. The Fly-Out and Fly-Over can be mounted directly to the pole or can be used in combination with our other accessories like our Birdhouse for more mounting surfaces, or the 3sided Wrap for those times you already have devices at the top of the pole. The Fly-Out/Fly-Over Pedestal is designed to mount one or more Fly-Outs giving you the option for a combination of cameras and devices. How about using it for a stand-alone mount. The Fly-Out Wall Mount Adapter that lets you attach the Fly-Out to the wall for easy and anywhere installation or use with the Corner Mount and have up to three camera attachments. All accessories are available in Dark Bronze or White. With all the different camera pole attachments that StrongPoles provides, your installation of the cameras or device will be trouble-free and stylish for years to come. For more information stop by our website or contact one of our Sales Engineers toll-free at 844-669-3537. This entry was posted in Blog, Camera Mounting Options, Camera Mounting Systems, Fly Over Camera Mount and tagged PTZ mount.